A 58-year-old male patient was admitted with complaints of fever, cough, and breathlessness of seven days duration. Initially, the cough was dry and later became productive with yellowish white expectoration. He was hypertensive and was suffering from COPD for which he was frequently hospitalized earlier and was on treatment for the same. He has been a chronic smoker from 18 years. On physical examination, the patient was febrile with temperature of 102°F, pulse rate of 100/min, respiratory rate of 18/min, and blood pressure of 124/84 mmHg. Oxygen saturation was 88% in room air. On respiratory examination, there was decreased air entry in the left infrascapular and infra-axillary areas with bilateral basal crepitations. Laboratory investigations revealed total leukocyte count of 10,420 cells/mm 3 with normal range of differential count. Blood urea nitrogen was 86.6 mg/dl and serum creatinine of 3.4 mg/dl. Procalcitonin level was within normal (< 0.5 ng/ml). Chest X-ray posterior-anterior (P/A) view revealed left lower lobe consolidation with parapneumonic effusion and mild pericardial effusion. Blood culture was sent on day two and did not yield any aerobic or anaerobic organisms. He was started on Amikacin 250 mg IV BD, Meropenem 1 g IV 8 th hourly, and Levofloxacin 500 mg OD empirically from day two of admission. There was a slight initial improvement; however, the condition of the patient progressively deteriorated with increase respiratory distress. In view of the worsening condition of the patient, a diagnostic pleural tap was done and was sent for culture and sensitivity and cytological examination. Cytological examination revealed a total count of 118 cells/mm 3 , of which 90% were lymphocytes and 10% neutrophils. Glucose was 114 mg% and protein 3.3 g%. No malignant cells were observed. Pleural fluid culture did not yield any aerobic or anaerobic organisms. The condition of the patient did not improve; his respiratory distress increased and a diagnosis of pulmonary edema was made. Suddenly, the patient started coughing out copious amount of sputum which was sent for culture and sensitivity. No repeat blood or pleural fluid culture was sent. The same evening (day six) the patient expired. Septic shock with multiorgan failure was mentioned as the underlying cause of death. Sputum sent on day six was processed. 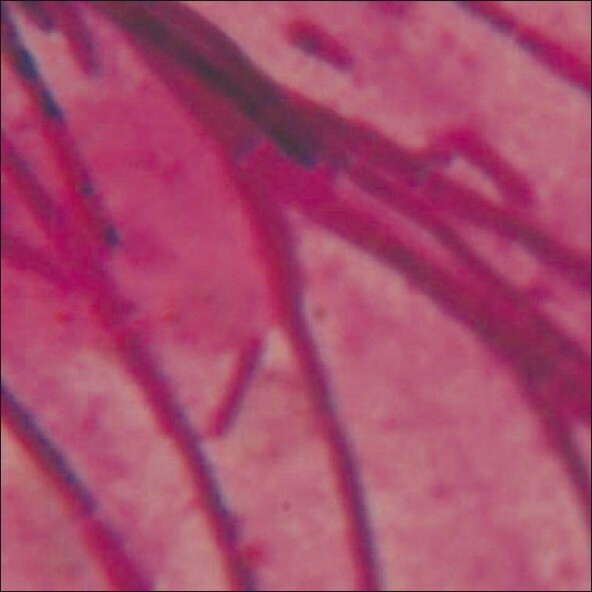 Gram stain of sputum showed few pus cells, occasional epithelial cells, and plenty of Gram positive thick septate hyphae with acute angle branching and few annelloconidia (Bartlett's grading 1+) [Figure 1]. The sputum was cultured onto blood agar and Sabourauds Dextrose Agar (SDA). Blood agar showed pure growth of dry, cream colored circular colonies after overnight incubation. 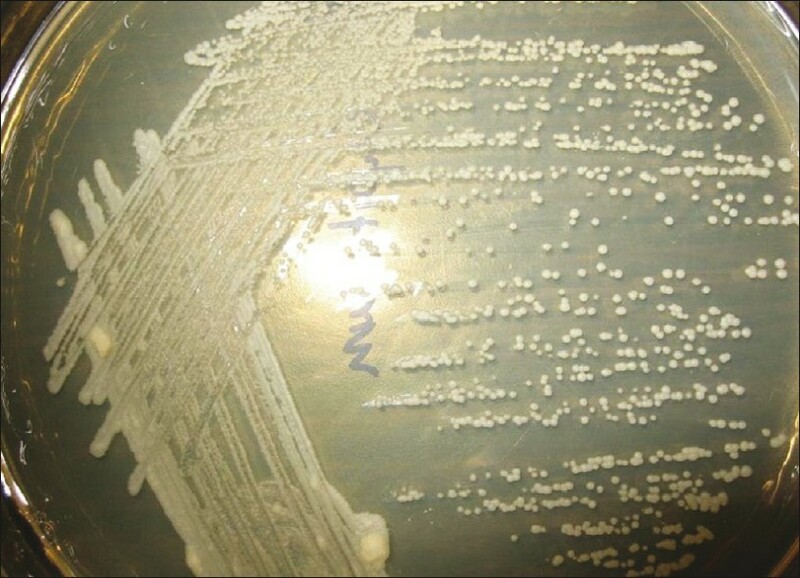 SDA incubated at 22°C and 37°C after overnight incubation showed similar type of colonies as on blood agar [Figure 2]. Gram stain of the colonies revealed yeast cells and septate hyphae. Further, Dalmau plate culture was put up and it showed septate hyphae with blastospores and annelloconidia. The isolate was resistant to cycloheximide and did not hydrolyze urea. The isolate was identified as Blastoschizomyces capitatus. Our case suggests a possible infection of B.capitatus as we obtained a pure growth from sputum sample, but were unable to cultivate it from the blood. The pathogenic etiology of this fungus was determined by clinical correlation and other laboratory investigation like pleural fluid analysis. 1. Wills TS, Degryse A, Lavina J, Sinnott TJ. Blastoschizomyces capitatus pneumonia in an immunocompetent male. South Med J 2004;97:702-4. 2. Maertens J, Meersseman W, Bleyenbergh VP. New therapies for fungal pneumonia. Curr Opin Infect Dis 2009;22:183-90. 3. Hartemink KJ, Paul MA, Spijkstra JJ, Girbes AR, Polderman KH. Immunoparalysis as a cause for invasive aspergillosis? Intensive Care Med 2003;29:2068-71. 4. Bulpa P, Dive A, Sibille Y. Invasive pulmonary aspergillosis in patients with chronic obstructive pulmonary diseases. Eur Respir J 2007;30:782-800. 5. Martino P, Vendtti M, Micozzi A, Morace G, Polonelli L, Mantovani MP, et al. Blastoschizomyces capitatus: An emerging cause of invasive fungal disease in leukemia patients. Rev Infect Dis 1990;12:570-82.